Abraham Jebediah "Abe" Simpson II, better known as Grampa Simpson, is a main character in the animated television series The Simpsons. He made his first appearance in the episode entitled "Grampa and the Kids", a one-minute Simpsons short on The Tracey Ullman Show, before the debut of the television show in 1989. Grampa Simpson is voiced by Dan Castellaneta, who also voices his son, Homer Simpson. He is also the grandfather of Bart, Lisa and Maggie Simpson. In the 1000th issue of Entertainment Weekly, Grampa was selected as the Grandpa for "The Perfect TV Family". Grampa Simpson is a World War II veteran and retired farmer who was later sent to the Springfield Retirement Castle by Homer. He is known for his long, rambling, often incoherent and irrelevant stories and senility. Grampa Simpson is the father to Homer Simpson, father-in-law to Marge Simpson and grandfather to siblings Bart, Lisa and Maggie. Grampa has also fathered two illegitimate children; a daughter named Abbie by a British woman named Edwina while in the United Kingdom during World War II, and Herbert Powell by a carnival prostitute. Grampa has an older brother named Cyrus, who lives in Tahiti and has multiple native wives. He also has a younger brother named Chet, who owns an unsuccessful shrimp company. Grampa was briefly married to Amber, the same woman Homer married on a drinking binge in Las Vegas. Grampa has also been briefly married to Marge's sister, Selma Bouvier, and was once romantically linked to Marge's mother, Jacqueline Bouvier. Grampa Simpson was also married to Rita LaFleur. Almost all of Grampa's biographical information is supplied by himself and seems to be made up, although this could be likely due to his old age. Many of his stories seem to be wildly inaccurate, often physically or historically impossible, and occasionally inconsistent even with each other, suggesting that Grampa is quite senile. It is unknown where Grampa was born. He claims that he came to America as a boy from the "old country", but he cannot remember which country it was, although most likely it was the United Kingdom or Ireland. Grampa was raised in New York City with his parents, Orville J. Simpson and Yuma Hickman. He gives his age as 83 in the Season 17 episode "Million Dollar Abie," while in "Grampy Can Ya Hear Me" (season 29), the family celebrates his 87th birthday. In the Season 25 episode "The Winter of His Content," Homer states that Grampa's father is still alive. Grampa is a veteran of World War II, where he served as Master Sergeant of the Flying Hellfish unit. At the very end of war in Europe, Grampa's unit "liberated" a stash of priceless art from surrendering German forces. The Flying Hellfish formed a tontine, and buried the art in a trunk at sea. Decades later, Montgomery Burns, the second surviving member of the unit, tried to murder Grampa in order to get the art, prompting Grampa to violate the tontine. When Grampa and Bart retrieved the art from Mr. Burns, the State Department arrived to return the art to its rightful owner. Grampa was a hated wrestler named "Glamorous Godfrey" in the 1950s, revealed in the episode "Gorgeous Grampa", starring him and Mr. Burns. Homer's mother, Mona Simpson, was married to Grampa for several years. According to "Let's Go Fly a Coot", they met in the 1950s and hooked up on the day Grampa allegedly broke the sound barrier. She became entranced with the hippie lifestyle after seeing Joe Namath's hair on television. She became a fugitive from justice after she abetted in the sabotage of a biological weapons research lab owned by Mr. Burns to deliberately poison everyone in Springfield. To explain this to his then-six-year-old son, Grampa said that Mona died while Homer was at the movies. Grampa has a poor, but sometimes loving relationship with his son, who placed him in a nursing home as soon as he could, despite Grampa selling his house in order to provide Homer with a mortgage. It is recurringly suggested that, while caring, Grampa was a strict disciplinarian who could be very controlling, neglectful, and even emotionally abusive towards Homer when he was growing up and he still had not forgiven him for that. Saying that, after Mona left Homer at a young age, Grampa brought up Homer by himself without hesitation. In the season five episode, The Front, Grampa admits to head of Itchy and Scratchy studios, Roger Myers Jr., that he worked as a cranberry silo nightwatchman for forty-years. The Simpson family will often do their best to avoid unnecessary contact with Grampa. A running gag in the show usually has Grampa in a cameo episode appearance where he wonders where everyone is or wishes to be noticed by the family. One example of this was when the family thought they left something on the plane in the episode "Fear of Flying", which revealed to be Grampa. Despite this, Homer has shown feelings of love for his father from time to time. Matt Groening, creator of The Simpsons, wanted to have a character that was "really cranky" and old, and who complained a lot and invented stories to tell to children, so he created Grampa. After naming the main characters after his own family members (except for Bart, an anagram of "brat", which he substituted for his own name), Groening refused to name Grampa after his grandfather, Abraham Groening. He left it to the writers to choose a name and they chose "Abraham", not knowing that it was also the name of Groening's grandfather. Grampa first appeared in the Simpsons short "Grampa and the Kids", which premiered on The Tracey Ullman Show on January 10, 1988. In the short, Grampa tells his grandchildren stories of "the good old days". When they stop paying attention to him, he feigns his own death to recapture their attention. The Simpsons writer Al Jean commented that Grampa is often the focus of pointed jokes about old people. He said the reason for that is because the staff is trying to illustrate how society mistreats the elderly, "and some of it is because people over 55 never watch our show". Bill Oakley and Josh Weinstein, former writers on the show, said that they liked to write episodes about Grampa because they are "obsessed" with old people. Weinstein commented that they "both love [old people] and seem to really hate them at the same time". He also said that he "enjoys" writing for characters such as Grampa and Mr. Burns because of their "out-datedness", and because he gets to use dictionaries for looking up "old time slang". 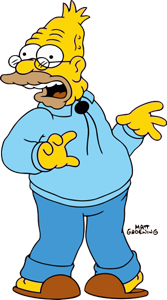 Grampa's voice is performed by Dan Castellaneta, who also voices numerous other characters, including Homer Simpson, Krusty the Clown, Barney Gumble, Groundskeeper Willie, Mayor Quimby and Hans Moleman. Castellaneta was part of the regular cast of The Tracey Ullman Show and had previously done some voice-over work in Chicago alongside his wife Deb Lacusta. Castellaneta likes to stay in character during recording sessions, and tries to visualize a scene in his mind so that he can give the proper voice to it. The episode "Grampa vs. Sexual Inadequacy" (season six, 1994) featured many interactions between Grampa and Homer, so Castellaneta therefore had to talk to himself when he recorded the voices for that episode. Castellaneta said it is hard for him to do Grampa's voice because it is "wheezy and airy". Nancy Basile of About.com named Grampa the fifth best character of The Simpsons, calling him a "perfect stereotypical old person". In the 1000th issue of Entertainment Weekly, Grampa was selected as the "Grandpa for The Perfect TV Family". Joe Rhodes of TV Guide considered Grampa's most memorable line to be "If I'm not back at the home by nine, they declare me legally dead and collect my insurance." 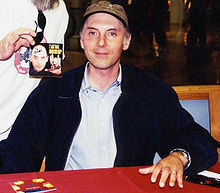 Dan Castellaneta has won two Primetime Emmy Awards in the Outstanding Voice-Over Performance category for voicing various characters, including Grampa. The first was awarded in 1992 for the episode "Lisa's Pony", and the second in 2004 for "Today I Am A Clown". In 2010, Castellaneta was nominated for the award for voicing Grampa and Homer in the episode "Thursdays with Abie". The Simpsons writer David Mirkin said that one of his favorite jokes on the show is the one where Grampa cycles down the street in high speed and shouts that he feels young again, and is then knocked flying from his bicycle after a doll's head flies into the spokes and falls into an open grave. In a review of the Grampa-centric episode "Lady Bouvier's Lover", Patrick Bromley of DVD Verdict said that he is "never terribly interested" in episodes that revolve around Grampa, because he believes Grampa is "great as a background character, but less so when he takes center stage." DVD Movie Guide's Colin Jacobson said in a review of the same episode that Grampa is "always fun" and "it’s nice to see him in an ebullient mood, at least for a while." Writer David Mirkin thinks that what makes Grampa funny is that the "boring" and "tedious" things he says are "actually funny" in the context of the boredom and the tedium. Mirkin thinks it is hard to make a "boring" and "tedious" character, such as Grampa, funny. He believes that what ultimately makes Grampa funny is that the things he says are "actually funny" in the context of the boredom and the tedium. Anne-Marie Barry and Chris Yuill, the authors of the book Understanding the Sociology of Health, commented that in episodes in which Grampa appears, the comedy content is often generated by Grampa falling asleep at "inopportune" moments or "embarking" on long rambling stories about his youth. "Instances such as these match popular stereotypes that all old people are 'demented' and in poor health," they wrote. Alan S. Brown and Chris Logan wrote in The Psychology of The Simpsons that Grampa has the least amount of "power" in the Simpson family, and that he is treated as little more than a child and is often ignored. The family frequently laughs at his "failing" memory and his "ineffectual" attempts to get what he wants. They added that Grampa is left behind, forgotten, and rarely invited to spend time with the family. The authors commented that he is "not without influence, but he certainly does not play the traditional grandfather role in the family hierarchy." Brown and Logan also wrote that Grampa had a considerable influence in the formation of Homer's character, and that flashbacks in The Simpsons show what an "angry", "critical" father he was to Homer. "He yelled, used corporal punishment, and constantly belittled Homer's attempts to have fun, date, and excel at various activities," they added. The authors said that Homer tries "in vain" to repair his relationship with Grampa and continuously seeks for his approval, but Grampa continues to be "as critical as ever". In his book Understanding the Psychology of Diversity, author Bruce Evan Blaine wrote that Grampa is typically portrayed as a "doddering", "senile", and "dependent" person who is a "trivial" and "often disposable figure" in his son's life. Playmates Toys created two Grampa Simpson action figures for the World of Springfield series. The first, released in May 2000, depicts Grampa in his usual appearance. The second, "Sunday Grampa", was released in June 2002, and depicts Grampa in his Sunday church clothes. Alongside the television series, Grampa regularly appears in issues of Simpsons Comics, which were first published on November 29, 1993 and are still issued monthly. Grampa also plays a role in The Simpsons Ride, launched in 2008 at Universal Studios Florida and Hollywood. ^ "Wedding for Disaster". The Simpsons. Season 20. Episode 15. 2009-04-29. Fox. ^ "Lady Bouvier's Lover". The Simpsons. Season 5. Episode 21. 1994-05-12. Fox. ^ a b "TV: Breaking Down the List," Entertainment Weekly, #999/1000 June 27 & July 4, 2008, 56. ^ Swartzwelder, John; Kirkland, Mark (November 23, 2003). "The Regina Monologues". The Simpsons. Season 15. Episode 04. Fox. ^ Martin, Jeff; Archer, Wes (February 21, 1991). "Oh Brother, Where Art Thou?". The Simpsons. Season 2. Episode 15. Fox. ^ Payne, Don; Moore, Steven Dean (2005-12-18). "Simpsons Christmas Stories". The Simpsons. Season 17. Episode 365. Fox. ^ Oakley, Bill (2006). The Simpsons season 9 DVD commentary for the episode 'Lisa the Simpson' (DVD). 20th Century Fox. ^ Cohen, Joel H.; Nastuk, Matthew (2002-01-06). "Brawl in the Family (The Simpsons)". The Simpsons. Season 13. Episode 276. Fox. ^ Kruse, Nancy; Chun, Daniel (March 11, 2007). "Rome-old and Juli-eh". The Simpsons. Season 18. Episode 15. Fox. ^ Cohen, David; Dietter, Susie (May 5, 1996). "Much Apu About Nothing". The Simpsons. Season 7. Episode 23. Fox. ^ Groening, Matt (1991). The Simpsons Uncensored Family Album. Harper Collins Publishers. ISBN 978-0-06-096582-2. ^ Collier, Jonathan; Lynch, Jeffrey (April 28, 1996). "Raging Abe Simpson and His Grumbling Grandson in 'The Curse of the Flying Hellfish'". The Simpsons. Season 7. Episode 22. Fox. ^ Appel, Rich; Silverman, David (1995-11-19). "Mother Simpson". The Simpsons. Season 07. Episode 08. Fox. ^ Martin, Jeff; Kirkland, Mark (1992-12-03). "Lisa's First Word". The Simpsons. Season 04. Episode 10. Fox. ^ Cohen, David X.; Kirkland, Mark (1997-11-09). "Bart Star". The Simpsons. Season 09. Episode 06. Fox. ^ Oakley, Bill & Weinstein, Josh. ; Archer, Wes (1994-12-04). "Grampa vs. Sexual Inadequacy". The Simpsons. Season 06. Episode 10. Fox. ^ Kreisberg, Andrew. ; Nastuk, Matthew (2003-02-16). "Barting Over". The Simpsons. Season 14. Episode 11. Fox. ^ Kogen, Jay; Wolodarsky, Wallace; Silverman, David (1991-03-28). "Old Money". The Simpsons. Season 02. Episode 17. Fox. ^ a b c Rhodes, Joe (October 21, 2000). "Flash! 24 Simpsons Stars Reveal Themselves". TV Guide. ^ BBC (2000). The Simpsons: America's First Family (6 minute edit for the season 1 DVD) (DVD). UK: 20th Century Fox. ^ Groening, Matt (2002). The Simpsons season 2 DVD commentary for the episode 'Old Money' (DVD). 20th Century Fox. ^ Groening, Matt (1997). Richmond, Ray; Coffman, Antonia, eds. The Simpsons: A Complete Guide to Our Favorite Family (1st ed.). New York: HarperPerennial. pp. 14–15. ISBN 978-0-06-095252-5. LCCN 98141857. OCLC 37796735. OL 433519M. ^ Oakley, Bill (2004). The Simpsons season 5 DVD commentary for the episode "Lisa vs. Malibu Stacy" (DVD). 20th Century Fox. ^ Weinstein, Josh (2004). The Simpsons season 5 DVD commentary for the episode "Lisa vs. Malibu Stacy" (DVD). 20th Century Fox. ^ Weinstein, Josh (2005). The Simpsons season 7 DVD commentary for the episode 'Team Homer' (DVD). 20th Century Fox. ^ Lee, Luaine (February 27, 2003). "D'oh, you're the voice". The Age. Retrieved September 21, 2008. ^ Morrow, Terry (June 23, 2007). "Voice of Homer Simpson leads his own, simple life". The Albuquerque Tribune. Scripps Howard News Service. Archived from the original on October 12, 2013. Retrieved September 5, 2008. ^ Castellaneta, Dan. (2005). Commentary for "Homer the Great", in The Simpsons: The Complete Sixth Season [DVD]. 20th Century Fox. ^ a b Mirkin, David (2005). The Simpsons season 6 DVD commentary for the episode "Grampa vs. Sexual Inadequacy" (DVD). 20th Century Fox. ^ Oakley, Bill (2005). The Simpsons season 6 DVD commentary for the episode "Grampa vs. Sexual Inadequacy" (DVD). 20th Century Fox. ^ Basile, Nancy. "Top 10 'The Simpsons' Characters". About.com. Retrieved December 27, 2008. ^ "Primetime Emmy Awards Advanced Search". Emmys.org. Archived from the original on February 15, 2011. Retrieved January 18, 2008. ^ Schneider, Michael (August 10, 2004). "Emmy speaks for Homer". Variety. Retrieved December 27, 2008. ^ "2010 Primetime Emmy Awards Nominations" (PDF). Academy of Television Arts & Sciences. Retrieved July 8, 2010. ^ Bromley, Patrick (February 23, 2005). "The Simpsons: The Complete Fifth Season". DVD Verdict. Archived from the original on January 16, 2009. Retrieved January 24, 2009. ^ Jacobson, Colin (December 21, 2004). "The Simpsons: The Complete Fifth Season (1993)". DVD Movie Guide. Retrieved January 24, 2009. ^ Mirkin, David (2004). The Simpsons season 5 DVD commentary for the episode "Lisa vs. Malibu Stacy" (DVD). 20th Century Fox. ^ Barry, Anne-Marie; Yuill, Chris (2008). "Ageing in society: a general overview". Understanding the Sociology of Health. SAGE. p. 212. ISBN 978-1-4129-3623-1. ^ a b Brown, Alan S.; Chris Logan (2006). The Psychology of the Simpsons: D'oh!. BenBella Books, Inc. pp. 3–4 (Chapter: The Family Simpson – Family Hierarchy). ISBN 978-1-932100-70-9. ^ Blaine, Bruce (2007). "Presentations and Portrayals of Older People". Understanding The Psychology of Diversity. SAGE. p. 160. ISBN 978-1-4129-2109-1. ^ "Series 1". The Simpsons Action Figure Information Station. Retrieved November 3, 2008. ^ "Series 9". The Simpsons Action Figure Information Station. Retrieved November 4, 2008. ^ Radford, Bill (November 19, 2000). "Groening launches Futurama comics". The Gazette. Archived from the original on September 15, 2008. Retrieved September 7, 2008. ^ Shutt, Craig. "Sundays with the Simpsons". MSNBC. Archived from the original on July 8, 2007. Retrieved September 7, 2008. ^ MacDonald, Brady (April 9, 2008). "Simpsons ride features 29 characters, original voices". Los Angeles Times. Archived from the original on September 14, 2008. Retrieved September 7, 2008. "The Problem with a Poo"
This page was last edited on 2 March 2019, at 19:40 (UTC).